Socrates, in Plato’s Republic, is fond of moving from the particular to the general, or vice versa, to see if something is true. If an ethical or moral maxim holds true as a good thing for one person, it stands to reason that it might hold true for society at large as well. Likewise, if something can be said with truth about society, it probably can be said about an individual person as well. This isn’t uncontentious, and as a method it may not always stand up to close scrutiny, but it’s a tendency in classical Greek thought, and Kant’s famous categorical imperative has always struck be as being a kindred maxim. For my own part, I find that the most dangerous times in my life are usually those when there isn’t really anything pressing that I have to do. Often in these periods there are plenty of things I should do, plenty of things I probably could do, and any number of things that I should probably get around to doing at some point. But never anything that I immediately need to do. Or more accurately still, nothing that can’t be easily put off as a task for future Nick to worry about. I often enjoy these days thoroughly, relaxing and frittering my time away on unimportant pleasures. The reason these times are so dangerous is that all of those things I avoid during them have an alarming way of turning into things that I absolutely, no bones about it have to do. And when future Nick turns into present Nick, and that life-changing essay needs to be handed in tomorrow, and I’ve done no reading, or that critical presentation needs to be delivered and I’m going to have to just wing it, or more often than any other, there’s no more money left and no reasonable prospect of more appearing anytime soon, so no more cigarettes for a while, present Nick tends to loathe past Nick with the fire of a thousand suns. If my temporal selves ever met in the real world, present and future Nick would quickly agree that past Nick needed to be immediately lynched, and all three of us would immediately vanish in a puff of smoke like Calvin’s perfect version of himself when he had an evil thought. If this is true of me, and long, painful experience has shown me that it is, then there’s a chance it’s true of society at large as well. Climate change is the most obvious example here. We could rearrange our entire society to save our planet from ecological destruction. We could cease burning carbon based fuels, put serious effort into researching alternative sources of energy, and actually work at putting them into practice. We could spare a moment’s thought for the populations of Sub-Saharan Africa or the Indian subcontinent, or the denizens of New Orleans or Miami or Venice when we fill up at the Esso. But that sounds like a lot of work, and fracking means we’re never going to hit peak oil anyway, and I have to get home because there’s something really good up on Netflix. But exactly the same logic applies to Syria, Iraq, and the broader unfolding crisis in the Middle East. A crisis which the left-wing British newspaper The Guardian recently announced in its editorial was a conflict on the scale of the Second World War; one that justifiably could be referred to, from the moment they deigned to enlighten us about it, as World War Three. The headline was risible to me, as someone who’s been following events in the Middle East as avidly and as closely as a westerner who doesn’t read Arabic and isn’t being paid is capable of doing since the Egyptian Revolution of January 2011. I can only imagine how much more risible it must have been to a citizen of Syria since 2011, or of Iraq since 2003. How pleasant that the white liberal media has finally woken up to the scale of the events it has been trivializing, cheer-leading, downplaying, condemning or ignoring since they began, I can imagine them thinking. I can’t wait till it’s Lyons, Sheffield, Atlanta or Montreal that’s a smoldering pile of rubble, littered with the spent cases of depleted uranium shells. The editorial itself is perfectly sophisticated, and makes in essence the same point that I’m making here. It is, however, still a bit risible that people don’t seem to have understood what they meant. It’s not even a very good historical analogy. Yes, the Second World War is the last time Europe was pounded into the primordial dust by the malevolence of its own sons and daughters on a scale like we’re witnessing in the Middle East of today. But the last time anywhere in North America ever had that experience was the end of the US Civil War and Sherman’s march to the sea. And the last time what you might call ‘Western Civilization’ (a useful shorthand for Europe and her contemporary colonial outgrowths around the world) experienced a war as savage, unending, and as religiously malevolent as the poisonous death-struggle now enveloping the Middle East was the agglomeration of savage, deadly conflicts in the seventeenth century that historians traditionally lump together as the Thirty Years War, when Protestant and Catholic butchered each other for possession of the heritage of Christ. So when I read simplistic opinions about conflict in the Middle East, either opposing or defending western intervention in it, I find them at times a little difficult to take seriously. Because both proponents and opponents of Western intervention seem to miss the most important point of what is happening there, which is that it is happening, and will continue to happen, in spite of anything we do about it. We have missed our chance to intervene in any meaningful way. From now on, and since at least two years ago, events in the Middle East control us here in the West, and not the other way around. If you’re curious, the only moment where Europe and the Anglosphere could have meaningfully intervened, and many people would disagree with me even in thinking it was possible then, was a brief moment in 2011. This is the third world war. Right here, right now. We in the west are completely peripheral to it, and no decision we make or any intervention, military or humanitarian, that we undertake will make the slightest difference to its continuing, or even, if I’m completely honest, to its eventual outcome. We will be merely an additional complication for both sides to recognize and deal with. The bombs we drop, or God forbid any troops we deploy, will be pawns in a game that not even the governments they serve are actually playing. Their usefulness will be relative, and impossible to predict. What is bad for ISIS may be good for Iran and its puppet Assad regime. What is bad for Iran and Assad may be good for the sheikhs of Dubai and Saudi Arabia. It will make absolutely no difference to the outcome of the conflict itself. We aren’t directly involved in this war yet, but we can’t rule out that it won’t come home to us someday soon, as a different war did to America on December 7th, 1941. We have that day fresh enough in our minds to remind us of how thoroughly events can rule the powerful, rather than the other way around, but we have to go a little further back for a better analogy to what might be happening right now to the United States and the world order it’s presiding over. This was mostly wishful thinking. Rome’s mastery of the Mediterranean was unquestioned, and would remain so for centuries to come. It wasn’t even a prophecy that required supernatural explanations. A reasonably keen observer of the Roman political situation in 140 BC could well have spotted the tensions that would eventually culminate in the bloody civil war that would bring down the curtain on the Roman Republic, and usher in the age of the Augustan Emperors. The Sibyl was probably just a very convenient pen name for a keen geopolitical analyst who knew his/her prognostications would be much more widely read if they came from the mythical Sibyl. But this was known from Egypt to Asia Minor as the preordained destiny of the Roman people. The Romans knew it too, and while they alternately scoffed, grew fearful, excoriated each other for their depravity, and tried to put their own house in order, they were haunted even in the moment of their world-spanning triumph by the suspicion of their impending doom. Every European empire that has followed them, from that of Spain to that of Britain to that of the United States, has been plagued by similar Cassandras and rumours of Cassandras. But it came true. The history of Rome from Marius and Sulla to Romulus Augustulus is the history of Roman butchering Roman, and of the gradual ruination of the Italian peninsula. By the age of Justinian, Rome was a provincial backwater with a famous name and a lot of crumbling ruins. The Barbarians never invaded. That’s one of history’s great myths. For the most part they were invited in when there weren’t enough Romans left in the world to fill an army. The Goths, the Vandals and even the Huns served as foederati in the armies of the various rulers of the late Empire so they could go on killing each other and their fellow Romans, until eventually they were all that remained, and only the idea of Rome had survived. It is one of history’s little ironies that many of the near-eastern peoples they fought, and occasionally that they conquered and dispersed, like the Jews, the Armenians and the Persians, have endured where they did not. Now, in the Twenty First Century AD, or CE, as we’ve arrogantly begun to call it, the superpower bluntly trying to shape the Middle East to its liking is the United States of America, and its capital is even more removed and distant from the fighting and chaos it tries desperately to control. Unlike Rome, America is unwilling or unable to summon the cold brutality needed to truly put an end to the strife that so worries it. When the Jews revolted against Roman rule three times in two hundred years, Rome eventually razed Jerusalem to the ground, renamed it Aelia Capitolina, butchered the Jews and their leaders and statesmen, and obliterated the very idea of an independent Jewish state. It won them peace and quiet, for a time. America, for very good reasons, is unwilling to truly unleash the full fury of its military arsenal on the Middle East. They certainly could bring peace to the region if they did, but only if they were willing to leave it a radioactive wasteland devoid of all life, human or animal, and to live with a faint green glow in the eastern sky for the next few thousand years to remind them of what they did. They are willing, instead, only to deploy short-term solutions; supporting this state against another, bombing this group of Islamists, supporting that one, and cracking down on another through a proxy. I’m glad they’re only going that far, I suppose, because all of humanity might be wiped out by the nuclear option, But the measures they’re taking will only, perhaps, buy time. And in the end they will likely only spawn more hatred and engender still deeper chaos. The barbarian invasions of Europe may be one of history’s greatest myths; Rome’s decline was entirely its own fault, and wasn’t imposed by any kind of external force. The insistence that every great empire’s decline will unfold exactly like Rome’s might be another, but far and away the greatest myth of them all is that the study of history will teach us lessons about how to avoid making the same mistakes our ancestors did. Even when this is true, which it rarely is, it doesn’t prevent us from making fifty new mistakes to make up for the old ones we successfully avoid. Why study it then? I’m honestly not sure, and I ask myself almost every day. The best answer I’ve come up with so far is that, like poetry, you may not see why it’s relevant when you first read it, but five, ten, twenty years down the line, as your life unfolds and good and bad things start happening to you, something might come to you and you’ll remember, in a flash of insight and understanding, that line you read that made no sense at the time, and you’ll be glad you took the trouble to read Auden, or Whitman, or whoever else floats your boat. As an example of what I mean, something from my knowledge of history that keeps coming to me recently, and giving me a little bit of hope as I look at a world stage that only seems to get bleaker, darker and still more terrifying, is a line from John Adams. In 1773, as tensions between Britain and its thirteen American colonies kept rising higher and higher, and compromise and moderation became less and less possible, or even desirable, he wrote to his wife Abigail that he despaired of his fellow Americans. He called the problems they faced ‘too grand and multifarious for my comprehension,’ and of his generation of Americans, he wrote that ‘We have not men fit for the times. We are deficient in Genius, in Education, in Travel, in Fortune, in every Thing. I feel unutterable anxiety.’ John Adams went on to be the second President of the new United States, and that generation of feckless losers he’s describing went on to be the Founding Fathers of the United States, reverentially cited by their descendants as the ultimate arbiters of political wisdom. Even when they weren’t. Even when the person speaking knows nothing about them at all, and is massively distorting who they were and what they intended. They’re who he thinks of when he things of the perfect generation of Americans; the ones whose example this contemporary one is so spectacularly failing to emulate. I may not know much about the future, or whether there’s any truth to these claims about History, but I do know that I can relate exactly to how he felt when he wrote that. In this narcissistic, shallow age of selfies and lattes and hashtags and textspeak, it’s really hard to believe that any of us, let alone most of us, like our grandparents in the so-called ‘Greatest Generation’ will prove more than we appear, and rise to the really insurmountable challenges we’re facing on pretty much every front of our collective existence. And maybe we won’t. Maybe we’re totally doomed. Worst of all, maybe we totally deserve to be. I obviously don’t know that, and I have no way of knowing. But if history has any lesson at all here, it’s that my opinions on the subject are irrelevant one way or another, and we very well might be all right in the end. So let’s be prepared, and do the best we can with what we’ve got, because if we pull it off, then we, not our grandparents, will end up being the Greatest Generation. A friend of mine recently suggested to me that I write a post detailing what I think about North Korea. In fairness, I have no idea what to say. This is a country like no other on earth. One that lives through unimaginable brutalities every day, and which we in the west are content to let linger in a long, horrible nightmare that has, for the people of this hermit kingdom, lasted over 50 years. See the movie Kimjongilia if you want to know what life is like in this benighted country. It will horrify you. My brother in law, who’s a film director, once interviewed a survivor, which seems the only appropriate word to use, of North Korea. He asked the man’s South Korean handler if his story was particularly terrifying. He said no. They’re all like that. We turn a blind eye because…I’m not entirely sure why, to be honest. I imagine it has a lot to do with not wanting to antagonize China, given what happened last time the west tried to extirpate this vicious bunch of thugs. Read Kissinger’s Nixon in China for an account of how Mao’s China went to war to defend this stupid little republic. And because they have nuclear weapons. It seems pretty clear now that this is the case. 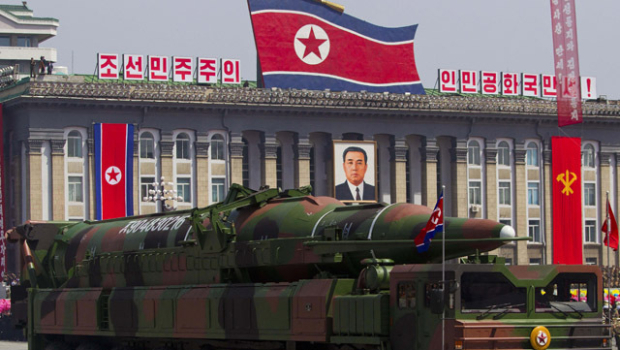 North Korea now has a small nuclear bomb that it is capable of putting in a missile. A missile that could potentially eradicate part of Japan, South Korea, US Bases in the Pacific Ocean, or even, and this is the ultimate nightmare scenario, if unlikely, the continental United States itself. We all woke up a little less safe this morning. But my first thought goes to the people of Japan. How unfair that one country should have such a sordid nuclear history to begin with, and now have to live with the almost daily threat of annihilation. And needless to say, the people of North Korea have a lot less reason to be hopeful now. No one will be coming to liberate them from this hyper-repressive regime anytime soon. The risk is now too great. The ultimate outcome depends a lot on what China decides to do. China remains the DPRK’s biggest supporter. Indeed, without Chinese aid, it’s doubtful the people of the country could survive at all, let alone that the regime could possibly survive. But of course, China likes this. China enjoys having a client state under it’s control. It feels that this is natural. And as such, is unlikely to do more than slap the young Kim-Jong Un on the wrist. But in the end, today’s developments signal the likely freezing of the status quo on the Korean peninsula. I’m not really listening to the threats. I tune them out. This is such a ludicrous regime that it actively benefits from racheting up the international tension like this. I imagine they’re bluffing. I don’t think they’d do it. Bomb a nearby country, I mean. I don’t believe that even they are that twisted.